One of my favorite days in Seattle is PARK(ing) Day where people turn metered parking spots into temporary mini parks....as in literally the park is the length of a parking spot. PARK(ing) day is actually not a Seattle only event, it takes place world wide and its mission is to call attention to the need for more urban open space. People get so creative about their spaces. I love spending my lunch hour looking at all the installations. 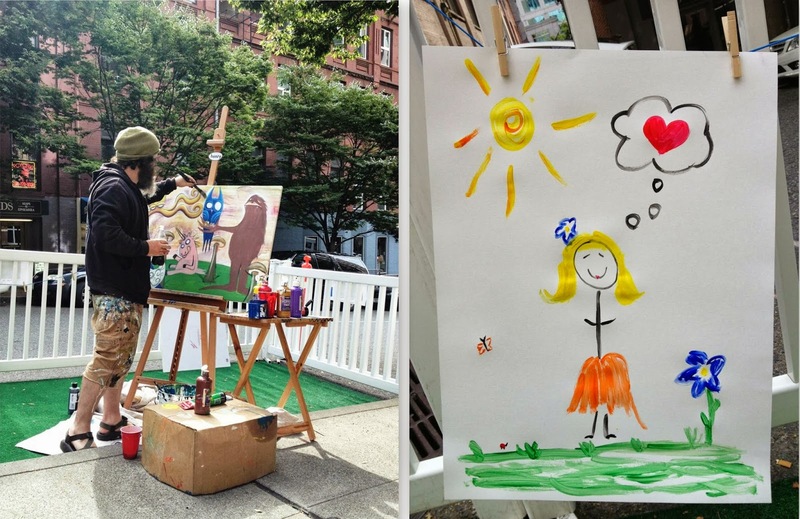 My favorite one this year was a park that had easels set up with paints and brushes, and anyone off the street could sit down and paint. It was awesome! Now, my painting ability can be compared to that of a kindergartner, but it was a rather therapeutic way to spend the lunch hour regardless. Check out the real artist, though! Thanks for being so cool, Seattle!